Origin Northern and central Europe and western Asia. Shapes Seed vessels are small, brown hairy achenes, with long, feathery tails, like those of the Traveller's Joy or Wild Clematis. Pasque-flower scientifically known as Pulsatilla vulgaris belongs to the Buttercup family (Ranunculaceae), and is closely related to the genus Anemone. The plant is native to northern and central Europe and western Asia. Other common names of Pasque flower are common passe flower, Dane’s blood, windflower, Prairie Crocus, meadow anemone , pulsatilla , Easter flower, wild crocus, April fools , badgers , blue money , blue tulip , cat’s eyes , Coventry bells , Dane’s flower , dream herb , flaw flower , flower of the wind , gosling , hart’s horn plant , headache plant, lion’s beard , mayflower , passeflower, prairie smoke and rock lily. Pulsatilla vulgaris is synonymous with Anemone pulsatilla. 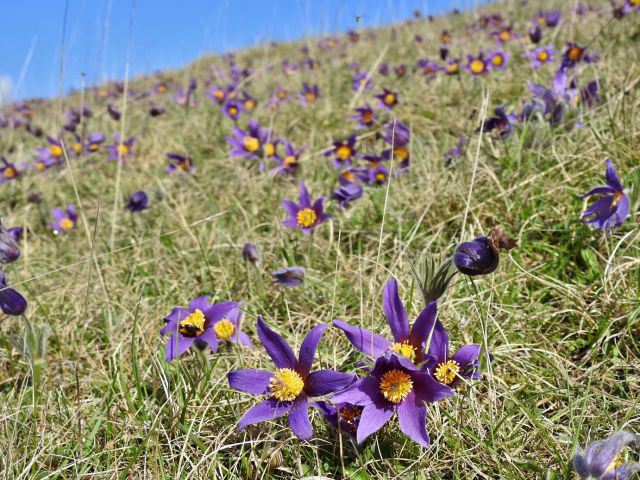 The plant is popularly known as pasqueflower and it blooms during Easter. There are many myths associated with the flower of Pulsatilla including the tragic story of Aphrodite, the Greek Goddess of Love. 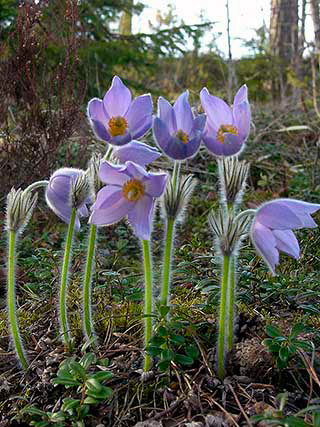 Tribal members and Indians were the first to discover the medicinal side of the Pulsatilla plant. 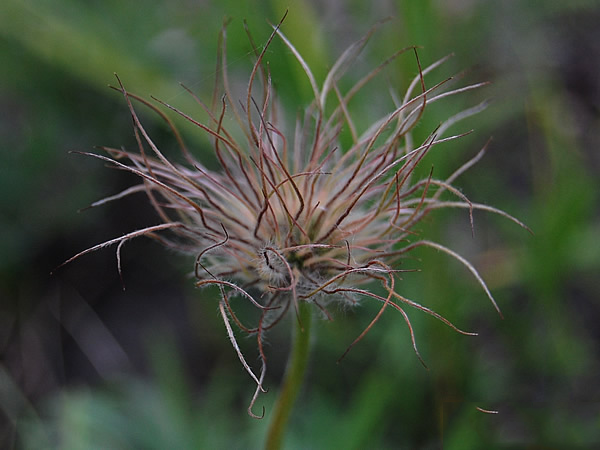 In herbal science, the above ground parts of Pulsatilla is dried and then used in herbal remedies. Pasque flower is a deciduous, herbaceous clump forming, perennial plant that grows about 15–30 cm high and when it is fruit-bearing up to 40 cm. The plant is found growing on dry prairies, moist meadows, and woods from Illinois and Wisconsin to Texas, westward and northwestward, north to Alaska. The plant prefers fertile, humusy, gritty, medium moisture, well-drained soils. Good soil drainage is essential for better plant growth. The plant has thick and somewhat woody root-stock. Leaves are alternate, palmately dissected with narrow, linear lobes. 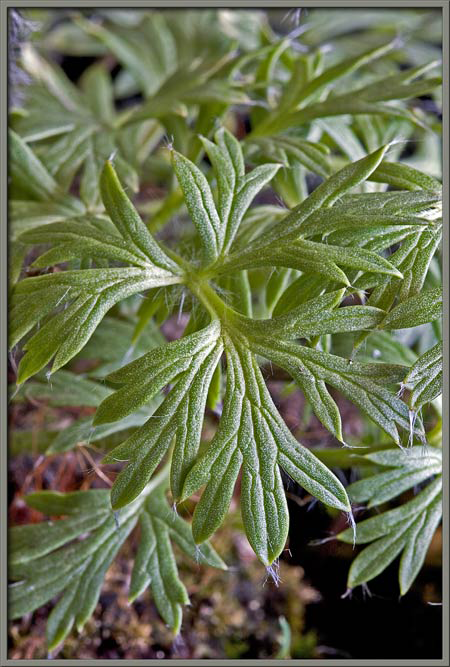 Hairy flower stems emerge from the ground in spring, sometimes when patches of snow are still on the ground. 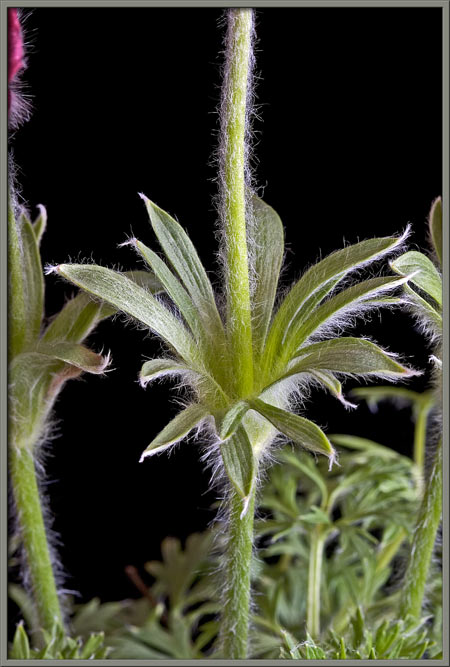 Pasque flower are about 1 1/2 inches across, are borne singly on stalks 5 to 8 inches in height, with an involucre of three sessile (i.e. stalk less) deeply-cut leaflets or bracts. The sepals are of a dull violet-purple color, very silky on the under surfaces. The lilac-colored pasque flower is covered with soft hairy down, usually producing only one or two flowers from its small root. The aerial parts are collected just before it flowers in the spring. Flowers are followed by equally-ornamental, plume-like seed heads (reminiscent of some clematis) in fluffy spherical clusters. Seed vessels are small, brown hairy achenes, with long, feathery tails, like those of the Traveller’s Joy or Wild Clematis. 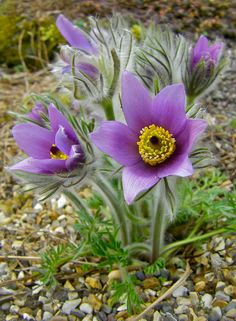 Tribal members and Indians were the first to discover the medicinal side of the Pulsatilla plant. In herbal science, the above ground parts of Pulsatilla is dried and then used in herbal remedies. 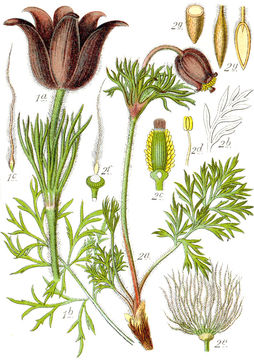 Pasque Flower is widely used to treat most of the reproductive system complaints of men. The herb can be used to reduce the pain associated with the swelling of the testicles, a condition known as orchitis. Pulsatilla is also an effective medication for treating colds and coughs. Homeopaths usually recommend this medicine to cure runny or congested nose accompanied by smelly, dense and yellowish-green colored catarrh. People suffering from such conditions also undergo diminished taste and smell senses. Such patients may also experience damp, spasmodic or intermittent coughing accompanied by discharge of yellowish-green mucus or phlegm and shortness of breath. These symptoms usually worsen when the patient is lying on his/ her left side. Bouts of violent coughing seem to occur during the evenings and nights and they may be set off when the person in lying down. Often, such spasmodic coughing may also disturb sleep. Using pulsatilla helps to get relief from such conditions and related symptoms. Furthermore, homeopath medical practitioners also recommend the use of pulsatilla for treating influenza wherein the fever is accompanied by alternating hot and cold flashes. There is a possibility that such patients may also suffer from earaches. 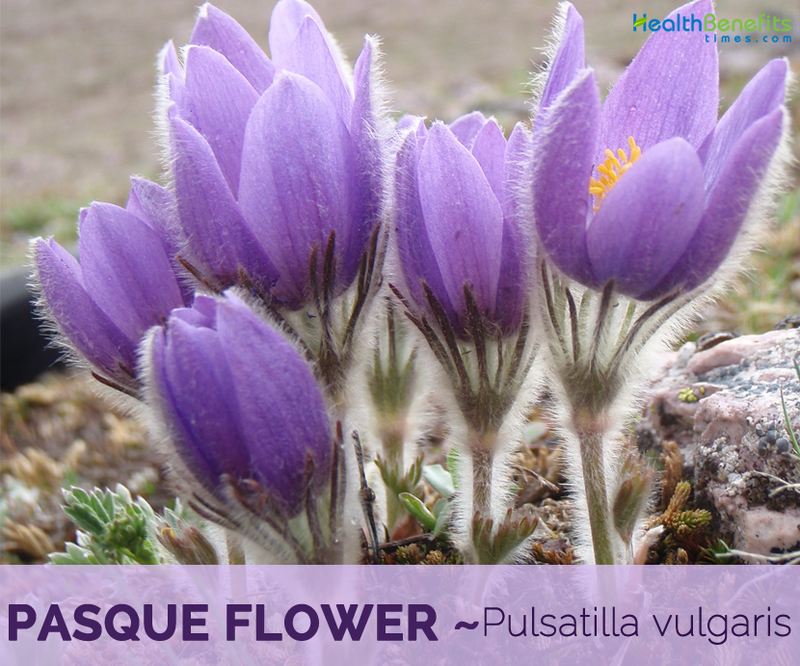 Pasque Flower is also found quite beneficial to treat several types of skin conditions like boils, bacterial infections, skin inflammation and chickenpox. Besides being a very useful remedy for women’s health problems, the homeopathic medicine pulsatilla is also recommended to cure sinusitis accompanied by headaches, tearfulness and yellowish catarrh. Basically, sinuses are very painful when touched. Symptoms of this condition include piercing pains on the face accompanied by unbearable and intolerable tenderness. Pulsatilla is effective when the person has a watery release from the eyes along with the incapacity to breathe normally. The individual may experience sharp pains on the right side of the face which may have a tendency to travel all over the face. Pasque Flower is quite effective in treating nervous problems like headaches, migraine, neuralgia, nervous fatigue, panic, depression, hyperactivity etc. The herb is also used to cure sleeping disorders, fatigue of the adrenal system and mental problems like senile dementia and schizophrenia. 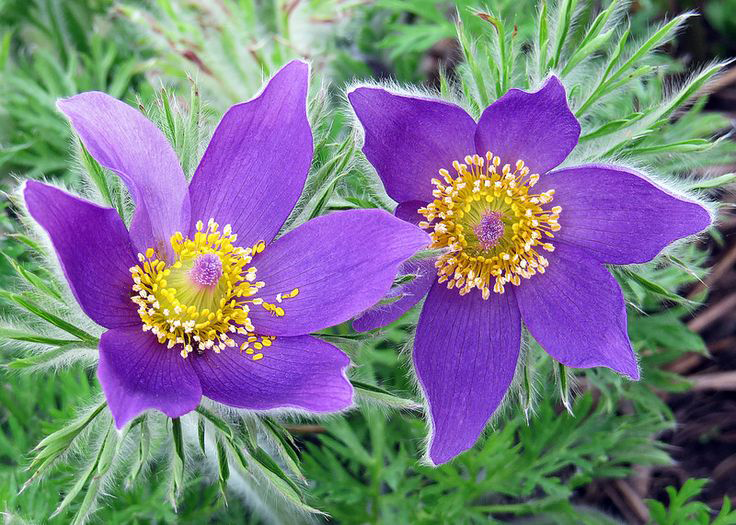 Pasque Flower is a common homeopathy remedy for women’s health issues, including short, variable, late, or absent menstrual flow (amenorrhea) with severe pain (dysmenorrhea). There may also be a delayed onset of menstruation in puberty. Severe premenstrual syndrome (PMS) may also respond to pulsatilla, especially if the sufferer is weepy and has indigestion and mood swings. In pregnancy, the remedy is sometimes used for indigestion, stress incontinence, fatigue, and morning sickness. It also helps curb cravings for sweets. Pulsatilla may also act on the uterine muscles to help turn a breech or mal presented baby in the uterus during labor. Pasque Flower is widely used to treat respiratory problems like cough, asthma, catarrh, whooping cough and inflammation of the mucus membranes as well as bronchioles. Pulsatilla is quite beneficial for heart treatment as the herb can be used to cure myocardium, a condition that results in thickening of the cardiac muscles. The herb is known to improve blood circulation and can treat problems associated with venous congestion. Pulsatilla is best used for all types of digestive disorder symptoms, including nausea, vomiting, indigestion, diarrhea, and itchy and painful hemorrhoids. When it comes to the person’s stools, no two are alike. The person’s mouth is dry, but there is no thirst, and either has a craving or dislike to rich foods that worsen the symptoms. 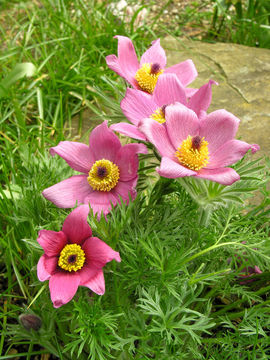 Pasque Flower is known to treat ear infections and earaches. It is the perfect cure to help relieve that severe throbbing pain of the ear. You can use pulsatilla when the ear infection feels worse at night, and it feels swollen, hot, and red around and inside the ear. The person may also experience itching, deafness, and a yellowish-green and thick discharge from the ear. 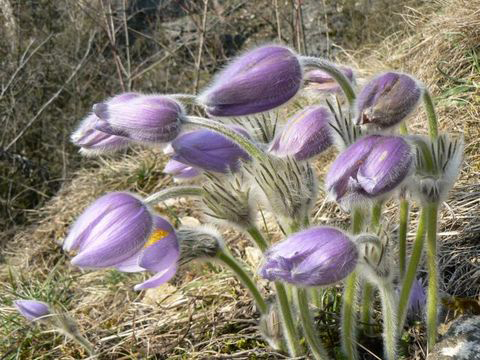 Pulsatilla is also very useful when the person’s lips are cracked, and the ears and nose feel stopped up. The homeopathic remedy is considered a great replacement to antibiotics for ear infections. Homeopathic Pasque Flower is known to treat eye inflammatory problems like conjunctivitis (pink eye), an inflamed cornea, and styes. The person’s stye may also have a link with a cold or an overall feeling of sickness. It is best to use pulsatilla during the early stages of a stye. Pulsatilla is perfect when there is a profuse and bland yellow mucus or pus discharge from the inflamed eyelid. Mucus may also appear in the corner of a person’s eyes. The person will also often feel worse from heat or at night and better after fresh air or a cold compress. They also often have a dry mouth and don’t have a desire for liquids. Pasque Flower is also considered a good homeopathic remedy for arthritic conditions such as rheumatoid arthritis, especially when a person’s pain or inflammation changes location. The pain may shift from joint to joint. It is also a good remedy for knee pains, which appear suddenly and the joints will be hot, pale, red, or swollen. Heaviness, trembling, stiffness, and restlessness are other symptoms of a person that requires pulsatilla for arthritis and joint conditions. The person’s pains are often worse at night or when it is warm, but the symptoms improve with coldness and open air. Whole plant is alterative, antispasmodic, diaphoretic, diuretic, emenagogue, expectorant, nervine and sedative. It is taken internally in the treatment of pre-menstrual syndrome, inflammations of the reproductive organs, tension headaches, neuralgia, insomnia, hyperactivity, bacterial skin infections, septicaemia, and spasmodic coughs in asthma, whooping cough and bronchitis. Externally, it is used to treat eye conditions such as diseases of the retina, senile cataract and glaucoma. 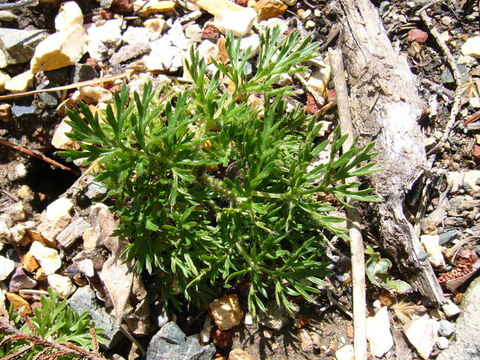 The plant is considered to be specific in the treatment of measles in homeopathic treatment. 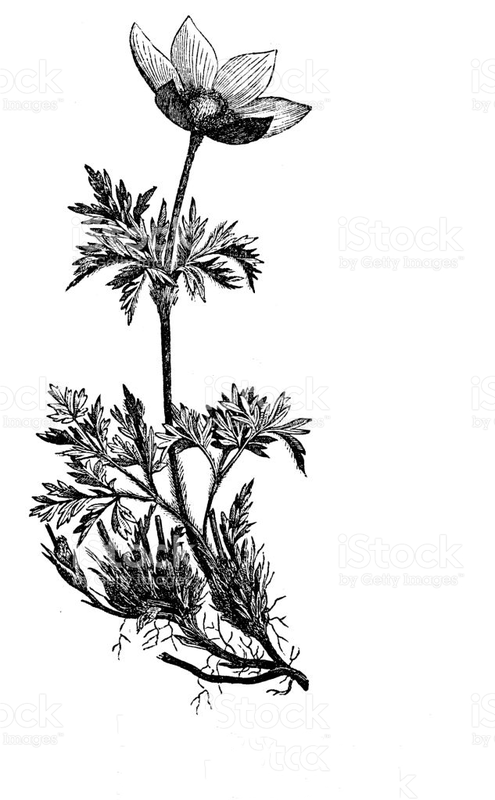 It is also used for treating nettle rash, toothache, earache and bilious indigestion. It is used as a cure for eye, urinary, gastrointestinal and genetic ailments. In men, it reduces pains associated with swelling of testicles called Orchitis. In women, it is used to treat female reproductive system. It treats Dysmenorrhea and painful ovarian conditions and helps in increasing the menstrual flow. It is a good remedy during child birth. It stimulates nerves and uterus. It eases the child birth process. It is effective in treating nervous problems as headaches, Migraine, Neuralgia, Fatigue, panic, depression and Hyperactivity. It is good for treating problems related to mucus membrane, respiratory and digestive tract disorders, chronic cough. It is useful in treating headache, cough cataracts, conjunctivitis, otitis, ear ache and sleep disorders. It treats skin conditions like boils, bacterial infections, skin inflammations and chicken pox. It improves blood circulation and treats problems associated with venous congestion. It helps to cure indigestion, heart burn and obesity. Dried whole plant of pulsatilla has been used in Europe for a variety of medicinal purposes, including dysmenorrhea and other gynecological disorders, skin diseases, asthma, and eye infections, and as a diuretic and expectorant. It has traditionally been used for coughs and as a sedative for sleep difficulties in France. As a topical wash, it is used to treat such eye problems as cataracts, or rheumatism. Leaves when bruised and applied to the skin raise sores. In homoeopathy it is considered very efficacious and even a specific in measles. It is recommended as a good remedy for nettle rash and also for neuralgic toothache and earache. It is administered in indigestion and bilious attacks. This homeopathic medicine is effective in curing many complaints among children, such as cough and cold accompanied by yellow discharge as well as earache. Homeopathic medicine pulsatilla is administered to women for problems related to menstruation, labor, menopause as well as pregnancy. 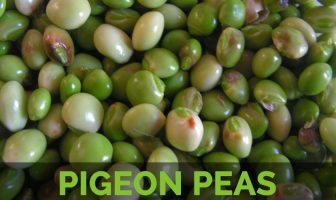 It is also recommended for curing respiratory ailments that are characterized by yellowish-green catarrh, eye problems and indigestion with changeable symptoms. It is recommended for treating eye problems, such as styes and conjunctivitis. Homeopaths also prescribe pulsatilla for treating digestive disorders that may be caused by consuming rich and oily foods. It also helps in healing indigestion, nausea, vomiting and gastroenteritis. This medication is useful in treating other complains, including headaches, migraine, acne, low backache, chilblains as well as fever accompanied by lack of thirst. Altitude Sickness: Prepare a decoction of dried wind flower. Have two times a day. Difficult Menses: Grind Viburnum opulus, wind flower and Partridge berry together. Take one tsp every day for 7 days. Insomnia: Make a decoction of Valerian, wild Lettuce and wind flower. Take it twice a day. Skin Diseases: For skin diseases wind flower combines well with Echinacea. Green dye is obtained from the flowers. Plants can be grown to form a ground cover, they are best spaced about 30cm apart each way. Whole plant is covered with silky hairs that give the ripe fruit the appearance of a mop head. An infused oil made from the flowers can be used to dress candles used in air magic,. Juice of the purple sepals gives a green stain to paper and linen, but it is not permanent. It has been used to color the Paschal eggs in some countries. Plant is slightly toxic and the toxins are dissolute by heat or by drying the plant. Repeated handling of the plant can cause skin irritation in some people. This remedy should be used with caution; excessive doses cause diarrhea and vomiting. It should not be recommended to patients with colds. It should not be stored for longer than 12 months before being used. Excess intake may cause Diarrhea, vomiting and convulsions. High or inappropriate doses may cause coma, seizures and even death. Contraindicated for those with intestinal bleeding and dysentery due to damp heat. It may cause inflammation and itching. Consult your doctor and Homeopath before consuming. Do not use the fresh plant. Pulsatilla should not be taken during pregnancy or during lactation. Large quantities of tincture can cause vomiting (more than ten or fifteen drops in an hour). Not recommended to treat gastritis. Overuse of the plant can cause depression, upset stomach and nervousness, and the tincture can be fatal in large amounts. Growing Climate Found on dry prairies, moist meadows, and woods from Illinois and Wisconsin to Texas, westward and northwestward, north to Alaska. Plant Size 15–30 cm high and when it is fruit-bearing up to 40 cm. Flower About 1 1/2 inches across, are borne singly on stalks 5 to 8 inches in height, with an involucre of three sessile (i.e stalkless) deeply-cut leaflets or bracts. The sepals are of a dull violet-purple color, very silky on the under surfaces. Fruit Seed- vessels are small, brown hairy achenes, with long, feathery tails, like those of the Traveller’s Joy or Wild Clematis.